Using old-fashioned, less-refined sweeteners, baker Cheryl Day adds flavor complexity to a Thanksgiving classic. 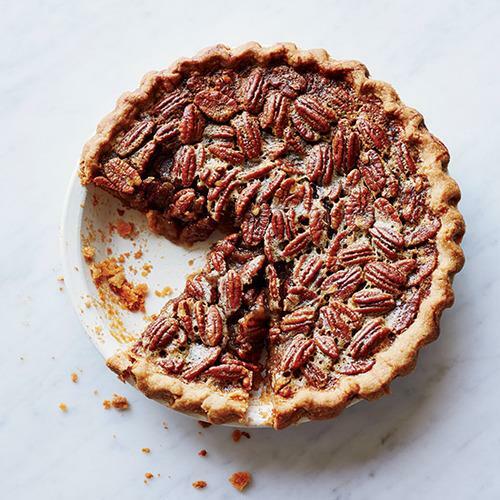 Of the three essential Thanksgiving pies—pumpkin, apple and pecan—pecan is the most polarizing. Some people look forward to it all year, while others find it way too sweet. But Cheryl Day of Savannah, Georgia’s Back in the Day Bakery makes a pecan pie to convert the naysayers. It tastes like dark caramel, toasted nuts and a little bit of bourbon—not just sweetness. Her fix: She doesn’t use the traditional light corn syrup. Instead, she turns to less-refined alternatives that used to be common in the South, like sorghum, sugarcane and dark corn. These syrups (and honey, too) transform pecan pie into a dessert of deep flavor complexity. Day’s recipe works with any one of them.